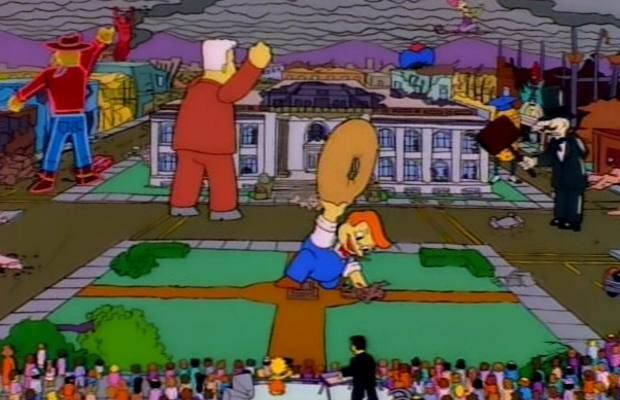 How The Simpsons Helps Me to "Explain Trump"
The Simpsons helps me to understand just about everything. Even Donald Trump. Consider "Attack of the 50 Foot Eyesores," a segment on one of their Halloween episodes. It begins with Homer trotting into the Lard Lad doughnut shop, eager to try their "Colossal Doughnut." What he receives, though, is a paltry piece of fried something that is a mere shadow of its advertised glory. So as an act of revenge, Homer steals the Lard Lad statue's metal doughnut. Then a freak electrical storm brings the Lard Lad statue to life, along with all of his fellow advertisements. As the metallic monsters go on a rampage, Lisa theorizes that if Homer returns the doughnut, the advertisements will return to their billboards. Alas, when Homer cedes the doughnut to Lard Lad, the destruction continues. Lisa then consults an ad agency, where they determine that maybe the monsters will go away if people stop paying attention. So they enlist the musical talents of Paul Anka, who writes a catchy jingle called "Just Don't Look." The jingle works. People stop paying attention, and the monsters fall to the ground. See where I'm taking this? Donald Trump says something outrageous, something offensive, something SOOOO over the top that we think that his political future is finished. But that hasn't happened. Not yet, at least. To be sure, the surplus of votes and raucous rallies signal that the man has devoted followers. But there is also a legion of disapproving onlookers devoted to Explaining Trump. The media masses pounce on every outlandish remark, image, or event. They marvel at the insensitivity, the brashness, and the complete disregard for civility. They propose theory after theory about his supposed "rise." There are even those who blame Obama. #ThanksObama. All of this, it would seem, is fuel for the Trump Machine. He doesn't need money. He doesn't need ideas. He doesn't need experience.He only needs attention. Trump is a reality television star, after all. But what if we looked away? What if we chose not to dignify his *stuff* with a response? What if we, as one Washington Post writer suggested, imposed a blackout? Yea, I know. It's not going to happen. And it's not going to happen because people like me are too damn interested in Explaining Trump. If I'm being honest (a rarity), my reading and listening habits in politics have been far too Trumpcentric of late. Sure some of this is "civic responsibility"--understanding what's happening in the world. But really, I'm gawking at a car accident, feeding my own worst impulses. In other words, I need Paul Anka right about now. Because I'm looking. And I'm not going to stop.